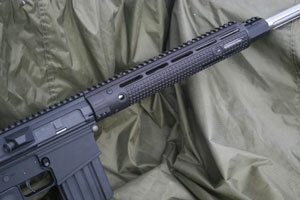 As of writing this page theres only a handful of aftermarket handguards and quad rails available for the .308 AR rifles. Keep in mind that if the handguard requires replacing the factory barrel nut be sure to get the correct thread for your .308 AR rifle. The threads are not standard like on the typical AR15. DPMS also as of this date has three different rail heights on their upper receivers. Know what you have. 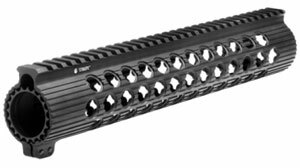 The 308 TROY TRX BATTLE RAILS from TROY INDUSTRIES are a nice light weight, high performance mid priced option for DPMS LR-308 and AR10 owners. 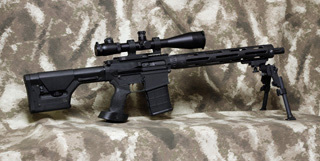 DPMS owners need to be aware there are three generation uppers that have picatinneys at different heights. Please read this PDF from TROY for detailed information. The new Troy™ TRX™-308 BattleRail is built off the revolutionary TRX™ Extreme and brings the same sleek, lightweight, low-profile design to the more powerful .308 platform. 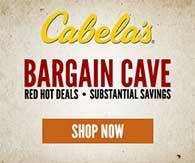 Proprietary barrel nut provides superior strength. 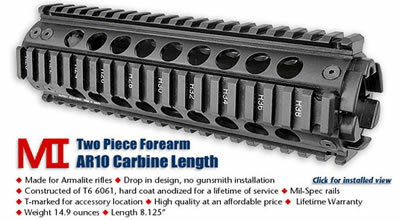 Includes handguard, barrel nut and three quick-attach rails. Not compatible with RRA LAR -8. Machined from 6061-T6 hardened aircraft aluminum and finished in MIL-SPEC Type III hard coat. 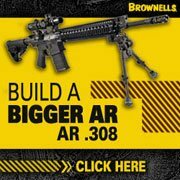 Available for Armalite AR10, DPMS LR-308 (Low Profile & High Profile)and other upper receivers that are compatible with the LR-308 and AR10 Platforms. 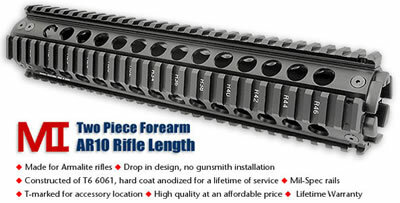 The PRi Carbon Fiber free float forearm rifle length for the AR-10, DPMS AR308 308 AR and SR25 uppers.. The forearm is constructed of light weight, high strength carbon fiber, aluminum, and high strength steel for best combination of weight and strength. 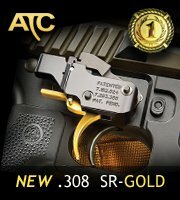 The carbon fiber also reduces the amount of heat transferred to the shooter during rapid fire or high volume. The PRECISION REFLEX INC PRI 308 DELTA CARBON FIBER HANDGUARD is available in multiple lengths and finishes for DPMS LR308 and ARMALITE AR10 weapon platforms. The 308 DELTA HANDGUARD also happens to be one of the most expensive free float handguards available for the 308 AR platform weapon systems. Coming soon.Go here for now. I have two of these yet I cant seem to locate any images that I took with my camera. I saw these listed at Brownells. 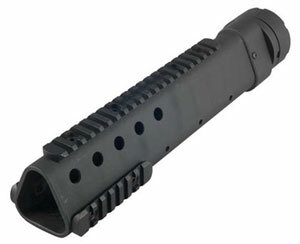 I have contacted SAMSON as I want clarification on how the handguard attaches to the barrel nut.